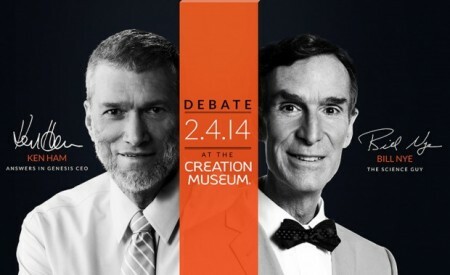 Did you get a chance to see the debate between Ken Ham and Bill Nye “the Science Guy” the other night? It was definitely entertaining. Unfortunately, it didn’t do much to clarify the issues that millions of Americans tuned in to learn more about. In fact, viewers got a lot of information from Bill Nye that simply is not true. For example, Bill Nye made it sound like science has discovered fossil layers all over the earth that are neatly stacked on top of one another with less evolved creatures in the earlier layers and more advanced creatures in the upper layers. He also made the incredible claim that you cannot find a single fossil which is in the wrong layer. This is such an elementary mistake, and exhibits such a complete ignorance of what the fossil record actually shows, that he should have been laughed off the stage. This is exactly the kind of extreme anti-intellectualism that Nye was supposedly trying to warn people about. Sadly, our society has been so “dumbed down” that there are lots of people out there that will actually believe him. During the debate, Bill Nye said that if we could find “just one” fossil that was out of place that we could change the world. Well, apparently he is either completely ignorant or he purposely told a huge lie to the American people. By the way, Dr. Burge is an evolutionist. To the surprise of many, ducks,1 squirrels,2 platypus,3 beaver-like4 and badger-like5 creatures have all been found in ‘dinosaur-era’ rock layers along with bees, cockroaches, frogs and pine trees. Most people don’t picture a T. rex walking along with a duck flying overhead, but that’s what the so-called ‘dino-era’ fossils would prove! In fact, a total of 432 different mammal species have been identified in rock layers containing dinosaurs. So does that mean that mammals have been around for tens of millions of years? No, what it could mean is that the way that evolutionists have been dating the dinosaurs is fundamentally flawed. Most people do not realize this, but T-Rex bones have actually been discovered that still contain soft tissue inside of them. If those bones truly were “millions of years old” that would be impossible. And carbon dating also provides strong evidence that the evolutionary timeline is seriously messed up. Due to the rate that it decays, there should be absolutely no measurable radioactive carbon left in any fossils that are “greater than 100,000 years old”. No matter how much radioactive carbon was there in the first place, it should be completely gone from anything that was once living after 100,000 years. But we find it in all of the ancient fossils that we dig up that get tested. We even find it in coal, diamonds and in dinosaur bones. If Bill Nye wants to believe in the theory of evolution that is his choice. But he should quit calling it “science”. Those that choose to believe in the theory of evolution are choosing to have blind faith in an ancient pagan religious philosophy despite what the scientific evidence actually demonstrates. If the theory of evolution was actually true, there should be millions upon millions of transitional fossils in the rock layers that show the development of one species into another species. Instead, we find just the opposite. So what does the fossil record actually show? Science is supposed to be about what you can observe, but nobody has ever seen Darwinian evolution take place. You cannot see it in the fossil record and you cannot see it in the laboratory. For much more on all of this, please see my previous article entitled “44 Reasons Why Evolution Is Just A Fairy Tale For Adults“. Once again, please feel free to believe whatever you want to believe. Bill Nye certainly does and Pat Robertson certainly does. I definitely strongly disagree with both of them. But I hope that everyone out there will quit claiming that evolution is a “proven fact” like Bill Nye has been claiming. He is only embarrassing himself in front of the entire country. Bill Nye can scoff at the Bible all that he wants, but he can never change the truth.